Kenneth Clark.Leonardo da Vinci, Penguin Books 1939, 1993, p144. 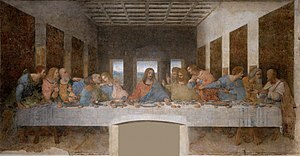 "Last Supper (copy after Leonardo)". Retrieved 2008-08-11. P.B. Barcilon and P.C. Marinin, Leonardo: The Last Supper, University of Chicago Press, 1999, p19. หน้านี้แก้ไขล่าสุดเมื่อวันที่ 4 เมษายน 2560 เวลา 21:21 น.